If you ask any Arab what we are cooking and they would simply say, "Upside down." Upside down means when you invert the meal, what is on the bottom is now on the top. So you put the meat in first and then the veggies and then the rice. Some in Jordan will put the meat and the rice and fry the eggplant or cauliflower separate and then place the veggie around the maglooba and not inside. Either way, it is easy to make. We will make this meal with chicken as it is the easiest to serve. 2 cup short grain rice. Place the rice in some warm water to soak while you are preparing the chicken and veggies. Put enough oil in a large skillet to fry the chicken. Salt and pepper the chicken and then place in hot oil for frying. Once the chicken is completely cooked remove from the oil and drain on some paper towels. Use separate oil for frying the veggies. Once the new oil is hot fry the cauliflower until browned slightly and then the potatoes. Once the potatoes are browned and done, remove from the oil and drain on paper towels. Place the chicken at the bottom of the saucepan. Then layer the cauliflower and potatoes on top of the chicken. Add the drained rice on top of the chicken and cauliflower and potatoes. Add enough water to cover the maglooba by 2 inches. Add in the two Maggi cubes or you can use chicken stock already prepared. Add salt to the maglooba also. Cover the pot and bring to a boil and then reduce the heat to a medium heat. 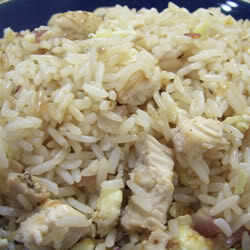 Cook for approximately 20 to 30 minutes or until the rice is cooked and done. Invert the maglooba on a large platter and serve. It is traditional to serve with a tomato and cucumber salad.